Hurricane Florence has become history. As I look at its retreating position, it is now centered near the Kentucky/Ohio/West Virginia intersection, and is a shadow of its former self. Florence was a formidable storm. On its approach, Winds were measured in the 130-140 mile-per-hour range when it was several hundred miles from its eventual landfall in southern North Carolina. By the time it reached land, the wind had dropped to a category one storm (72-105 mph) and was dropping further and would become a tropical storm soon after making landfall. That was the good news. The bad news was that Florence was one of the largest, rainiest windstorms in history. It made landfall on Thursday, September 20, 2018, and hung around its North Carolina landfall for a very long time. It dropped record rainfalls in many areas of North Carolina and South Carolina; parts of Georgia and neighboring states were inundated as well. The hurricanes were bad. They were long-lasting periods of misery, sitting, waiting and fearing the worst. The aftermath of each, for me, was a moderately strenuous period of cleanup activity and it was over until the next one, except for Irma, which was a bit more severe on the damage to my property than the others had been. My pontoon boat became landed in my front yard, and the efforts of several strong men, come-alongs, plus several years worth of good luck got the boat into the water, where it actually ran to the ramp across the lake, where it was removed. November 15, 1989 – Huntsville Alabama. That day had been a day like any other. I had spent my time after noon on my monthly construction progress visit to the construction site of a manufacturing plant that my architecture firm had designed. To monitor construction progress and to verify the work done so that the general contractor could make his draw against his contract, this scheduled monthly site visit was a task I enjoyed. Weather had been normal, if somewhat cloudy and a bit unseasonably warm. I had been looking forward to leaving the construction site, and heading to Rugby's, my favorite watering hole near my estranged wife's house in West Huntsville. As I pulled into one of my accustomed parking places behind the bar, and headed for the back door with the 'Employees Only' sign, I looked at the sky above me and recalled a term that I had not used in many years – glowering. To the west, and to the south, the sky was black, and it was only 3:30. This was not good. But I could hear Mr. Budweiser calling my name, and what could one hurt? Once inside, the owner greeted me and warned me about the weather forecast, which was being broadcast along with a tornado alert. Discretion and valor came into play, so I belayed the beer and headed back out to my Chevy Malibu station wagon and began the 20 mile trip through the center of Huntsville to the marina where I kept my houseboat, my living quarters until my finances got worked out. Hearing the emergency sirens wailing, I pulled from behind Rugby's onto AL 20/US 72, I took note of the fact that the blackness of the day had spread eastward, and the roadway lighting was on. Traffic was moderate, and I made speed limit time through the plethora of small shopping centers as I headed for the center of Huntsville, the grade of Monte Sano, Highway 431, and home on Guntersville Lake. At the Sparkman Road stoplight, as I sat patiently waiting, the sky assumed a deeper level of black. I had never seen a sky so dark in the middle of the afternoon. The only natural light was coming from afar, the edge of the clouds to the east and north. Black surrounded me with only a narrowing quadrant to the north and east where light was able to penetrate the clouds. The rain pounded and the wind howled. Suddenly, the traffic light, too, went black. I looked in the rearview mirror, hoping to see traffic lights behind me, but nothing. They were all black. As the traffic filtered itself through the Sparkman intersection, I noted that the traffic light at Jordan, the next one, was red. I accelerated briskly, but by the time that I had cleared most of the traffic from Sparkman, the light at Jordan disappeared into the blackness. The rain continued – my wipers were barely keeping up. The heavy station wagon was being buffeted from side to side as if it were a Volkswagen. The 431 traffic lights were operating but, seemingly triggered by my approach, they each winked out. I accelerated, taking a dangerous chance, hoping to get ahead of the rolling power failure. Highway 431 skirted Downtown Huntsville by a couple of blocks, and headed southeast up the Monte Sano slope. At the uphill grade, there were no cross streets, and no more traffic lights, and all appeared black. There were no streetlights or traffic lights or lights of any kind. The big V8 pulled me up the mountain briskly and I passed the Smoky trap where Alabama Highway Patrol/Huntsville cops set up their radar habitually. I was doing over 70 in a place that usually would have spelled a heavy fine. But police had other concerns on this afternoon. With the rain pounding, I crested the rise, and begin the downward track. The blackness was palpable; the air was heavy; the eminence of doom prevailed. The barometric pressure was so low that I could feel it. And then, the rain stopped. It did not slack off and casually quit, as is the way that rain usually does. I saw a Honda Accord speeding up the mountain in the oncoming lane. I saw a Toyota pickup truck in the rearview, behind me, driving as recklessly as I was, trying to get clear of whatever maelstrom of weather was following us. The four lanes of the road had been carved from the side of Monte Sano leaving a wall of rock on my right and a steep drop on the other side of the road to my left. Then the Honda was into the wall in front of me. The pickup truck was in the wall behind me. My station wagon was shaking so hard that my power steering belt screamed in agony when I dodged the Honda. The sound of the wind drowned everything else. And then, I was through it. My car started behaving normally once again. I stopped and went back to help, but my luck continued, because when I found the two cars, they were both moving away, only lightly battered. I continued on to the boat, and looked for someone to ask about the storm, but the only person I was able to find was the proprietor of the 431 Grocery near the marina, and he had no information. When I got to my boat, I used my phone to call my friends and see how Huntsville had fared, all to no avail. Phone service (cell phones were available, but I did not have one, this was a land line) all over Huntsville seemed to be out. Guntersville cable TV was working, and the Huntsville stations were all mournfully speculative about feared dead and other disasters. With on-the-scene reports, it was very apparent that no one knew anything. I quickly tired of the incessant speculation, and opened a book after supper. Huntsville, Alabama, was struck by a deadly tornado around 4:30 pm on Wednesday, November 15, 1989. From an initial touchdown point on the Redstone Arsenal, the storm cut a destructive, 18.5-mile swath on its northeast trek across the southern sections of Huntsville. Plowing through businesses and heavily populated residential areas of the city, the tornado left a tragic legacy; 21 dead, 463 injured and damage estimated at 100 million dollars. Twelve of the 21 fatalities occurred in automobiles as many persons were homeward bound during the afternoon rush hour. The storm was rated an F4 on the Fujita Tornado Intensity Scale. On my way to work, I went past the place where my incident had occurred, and the obvious things were that on the downhill side of the slope, there was no vegetation on either side of the point where I had been, and that the cleared area went down the mountainside to the valley below, where it abruptly ended. One of the stories that I heard was that of the two schools that were involved, one of them had a class of kids who stayed after school for an honors program, and, when the teacher heard about the storm, she had the insight to take those kids and put them under the concrete stairway just above the ground floor slab. I don't know how many kids were saved this way, but they certainly would have died without that teacher's brilliant efforts. Where my banker friend took flight. I had three friends/acquaintances who were injured by the tornado. Two of them were male drinking buddies and they were both injured slightly and recovered in a week or so. The third was a woman who I thought of as my banker. She was filling her car with gas at a gas station located at the corner of two four-lane plus turn lanes roads. Her account of the occurrence offered one of the most hair-raising stories that I heard. She was fueling her car, trying to keep her attention on the process at hand, hurrying to finish so that she could get away from any danger. With her attention drawn elsewhere, the approaching wall of the funnel was on her before she noticed; she was lifted off her feet and hurled across the intersection diagonally to the other corner, where she was eventually collected by an ambulance and taken to the hospital. She suffered a broken ankle and other semi-major injuries in the process, and was hospitalized for nearly a week. Eventually, she was able to return to her life as before. That lift measured over 100 feet in the air. It is amazing that her injuries were so slight. 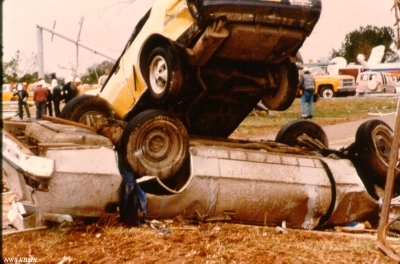 The next weekend, I was at my friend Doug Jones' house helping him work on a car that he used in amateur racing, when we heard the all-too-familiar sound of the warning sirens. Doug looked at me, we both looked skyward, and we departed the carport for the interior of his house. Once inside, Doug informed me that the safest place in the house was crouched down in the bathtub. We hurried into the bathroom, looked at the bathtub, I looked at him (6'1"). He looked at me (6'3"). We both burst out in gales of laughter until Doug passed me a Budweiser. A friend of mine saw a wind storm - he didn't know what type it was - blow a curb stone out of a street. It also make a bunch of very heavy church bells disappear forever out of a bell tower. And we think we can control the weather! !